“God will want to do something, I don’t know what it is, but he will say something special to each one of you while you’re away”. 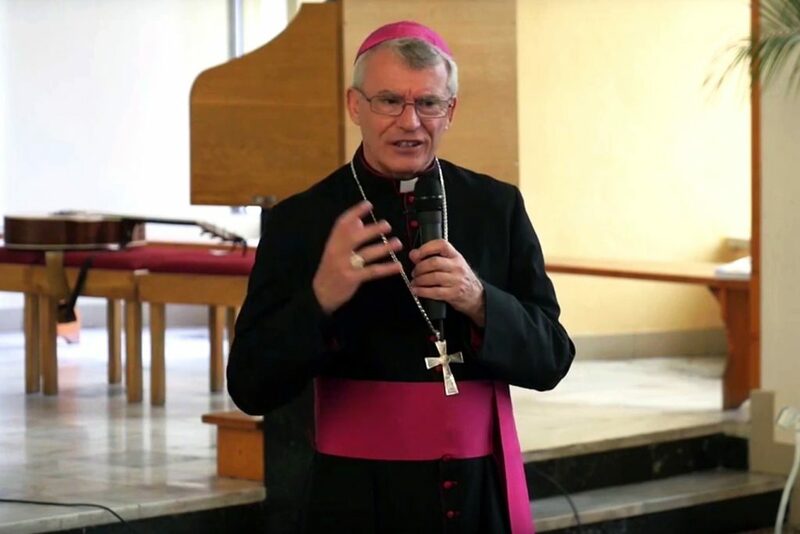 With these words, spoken at the Commissioning Mass in Perth held just before this year’s World Youth Day (WYD), Archbishop Timothy Costelloe encouraged young pilgrims of Perth to travel to Poland expecting to receive something that may transform their lives. The Archbishop reiterated this point at the WYD during a thought-provoking catechesis delivered in a parish on the outskirts of Krakow. Speaking on the theme of mercy to a crowd of English speaking pilgrims, the Archbishop explained ‘how’ one can position himself or herself so as to be touched by God’s mercy. He did this by inviting the young people to put Christ first at the centre of everything they know and, quoting Saint Pope John Paul II, he emphasised that a Christian’s witness to Christ “would be hopelessly inadequate if we ourselves have not first contemplated the face of Christ”. “I want you to embark on a journey with me as we gaze on the face of Christ, touching people with his mercy,” Archbishop Costelloe said. The Archbishop indicated that he would focus on three different key people in the Gospels as examples of the way in which God’s mercy reaches into the very depths of one’s human condition so as not to condemn, but to give new opportunities to start afresh in Christ. “I want you to say to yourself: how am I like this person? What is it about this person that might help me to understand what the merciful touch of Christ looks like or could look like in my life?” he said. The first Gospel chosen was that of Zaccheus, the infamous tax-collector who, trying to catch a glimpse of Jesus as He walked by, was met by the Lord with compassion rather than hostility. Describing Zaccheus as a man who must have been small not only in stature, but short in honesty, spirit and generosity, the Archbishop drew the pilgrims’ attention to the way in which Jesus does not reproach Zaccheus but simply asks to be invited to dinner at his house. “Jesus had this instinctive understanding that Zacchaeus was isolated, lonely, dejected, despised and marginalised. So in his wisdom and sensitivity, Jesus thinks, ‘What’s the best thing I can do to help this man understand that no matter what he’s done, he’s still loved, cherished, worth something?’” he explained. In his second example, the Gospel of the adulterous woman, Archbishop Costelloe captured Jesus Christ’s touch of mercy with even more poignancy. The Archbishop spoke of the men wanting to stone the woman (and claiming that their act was justified by the Law of Moses), as men who were probably more interested in tricking Jesus than punishing the adulterous woman. If Jesus had approved of their violence, the Archbishop explained, they would have accused Him of being callous. Had Jesus stopped the stoning, they would have condemned Him for being unfaithful to the Law of Moses. “Jesus starts writing in the dirt. What I think He is doing is He is trying to give these men a chance to come to their senses. He says, ‘Let the one with no sin cast the first stone.’ He then draws again. That’s an important detail. He wants to get them thinking, He’s being merciful to them too,” he said. “He then stands because one by one they had left. He got through to their conscience. They realised that they couldn’t throw the first stone, they weren’t perfect, so they left. Connecting the event to the depth of God’s mercy, the Archbishop explained that while this Gospel has at times been interpreted either as too permissive because Christ says, “I don’t condemn you”, or too harsh because Christ says, “Don’t sin again,” what really matters is the order in which these things are said. “This is where the touch of mercy comes in. The first thing Jesus says to this woman is ‘I don’t condemn you.’ That creates in the heart of this woman the space to be able to hear the next thing that Jesus says: ‘Go and sin no more’,” he said. In his final example, the Archbishop spoke of Peter’s betrayal of Christ and took a more direct approach, asking his audience whether they may have fallen into a betrayal of their own faith in front of friends and/or family. “We sometimes don’t want to be known as Catholics. Or we’re embarrassed about it because none of our friends seem to think this stuff matters, so we pretend it’s not important to us either,” he said. The Archbishop pointed his listeners to another moment in the Gospel in which God’s mercy went beyond the mere fact that a mistake had been made on Peter’s behalf. After the resurrection, Jesus asks Peter three times whether he loves Him. “Jesus and Peter encounter each other on the shore of the lake. Jesus takes Peter aside and says to him, ‘Peter, do you love me?’ Peter says, ‘Yes, I love you’. Jesus says, ‘Feed my sheep’,” he recalled. The Archbishop concluded his catechesis by again inviting the members of the audience to ask themselves: How am I like these three people? What is the story of my failures and betrayals? “They could probably not be greater than the failures of these three people. Yet nothing stopped Jesus from forgiving, from offering hope, a new beginning and a new way forward. If he did it for them, why would he not do it for us?” he concluded.